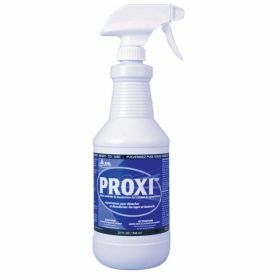 Proxi's hydrogen-peroxide-based formula will get rid of both stains and odors and then naturally degrade into oxygen and water. This environmentally friendly cleaning product contains no VOCs and no bleach.Just spray and walk away. A uniquely formulated product for quick removal of both water and oil soluble spots and stains. Removes grease, oil, dirt, ketchup, coffee, wine, soft drinks, blood and vomit. Malodour counteractant deodorizes and cleans without leaving a residue.